Anthony Martial was inside his own half when he collected Phil Jones' pass but he only had one thing on his mind. Sensing the disorder in Fulham's backline, the Frenchman got his head down and charged forward, accelerating away from Denis Odoi and skipping past Maxime Le Marchand before opening up his body to clip a low finish inside the post. That moment of brilliance helped Manchester United on their way to their eighth win in nine Premier League games. In the Sky Sports commentary box, Gary Neville likened it to a goal scored by Cristiano Ronaldo on the same ground in 2007. The comparison was later picked up by Ole Gunnar Solskjaer, who said Martial "has the talent" to reach Ronaldo's level. "I am glad he is in my team," the Norwegian added. "He has contributed to so many chances, so many goals. He is a Manchester United player. He excites the crowd. He excites the manager. He excites his team-mates. And he is a great character around the place." 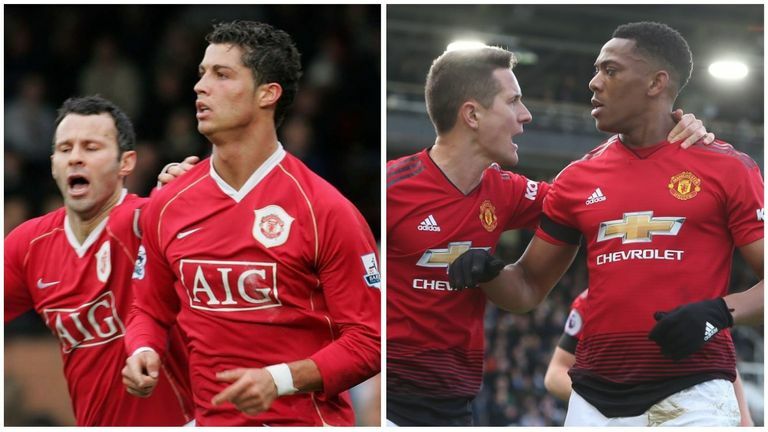 Gary Neville compared Anthony Martial's goal against Fulham to one scored by Cristiano Ronaldo in 2007, but whose was better? It is amazing to think that it is only a few months since all the talk around Martial was that Jose Mourinho was eager to sell him. The Portuguese did not hide his disapproval when the forward left United's pre-season tour of the United States to attend the birth of his son. Their relationship, it seemed, was becoming strained to the point of breaking. It is to Martial's credit that he was able to recover from that, winning back his place in Mourinho's team and scoring a string of important goals during his final months in charge. "One thing is top talent, another is a top player," Mourinho said in November. "He is now much closer to being a top player." Mourinho felt Martial was finally producing the kind of effort and application he demands from his wide players, but his improvement has gathered pace under Solskjaer. The caretaker boss has liberated his forward players and, like Pogba and Rashford, Martial has benefited. His total of two goals and two assists in seven Premier League appearances does not scream it - he scored seven times in 13 appearances under Mourinho earlier in the season - but Solskjaer is making better use of his strengths and a deeper look at the statistics proves it. The dribbling statistics are particularly revealing. Martial is completing twice as many under Solskjaer, his success rate jumping from 33 per cent to 52 per cent. The numbers show he feels empowered to take risks and they also hint at an increase in confidence. "Sometimes, when you're out on the field, it comes down to what comes naturally," he told Sky Sports recently. Solskjaer's renewed emphasis on counter-attacking certainly allows him to do what comes naturally. "The way we play with pace and power, we should never forget our history of counter-attacking, even though we are one of the teams that want to dominate games," Solskjaer told Sky Sports last week. "If teams drop deep we need to have a way of playing against those teams but also when we defend we defend to win the ball to counter-attack quickly." That's exactly what Martial did for his goal against Fulham, but would he have felt free to do the same thing under Mourinho? Manchester United have made more fast breaks than any other Premier League side under Solskjaer but their total under Mourinho was the lowest in the division. Martial vs Ronaldo - Whose was better? United have upped the intensity and Martial has followed suit. Against Fulham, he made more sprints (15) than any of his team-mates despite being withdrawn after 70 minutes. His average number of sprints per 90 minutes has jumped from ten under Mourinho to 13.7 under Solskjaer - an increase of more than a third. It is just another indication of how he is benefitting from the Solskjaer effect. His future was uncertain at the start of the season, but six months on and it could hardly be brighter. Martial is getting better all the time.